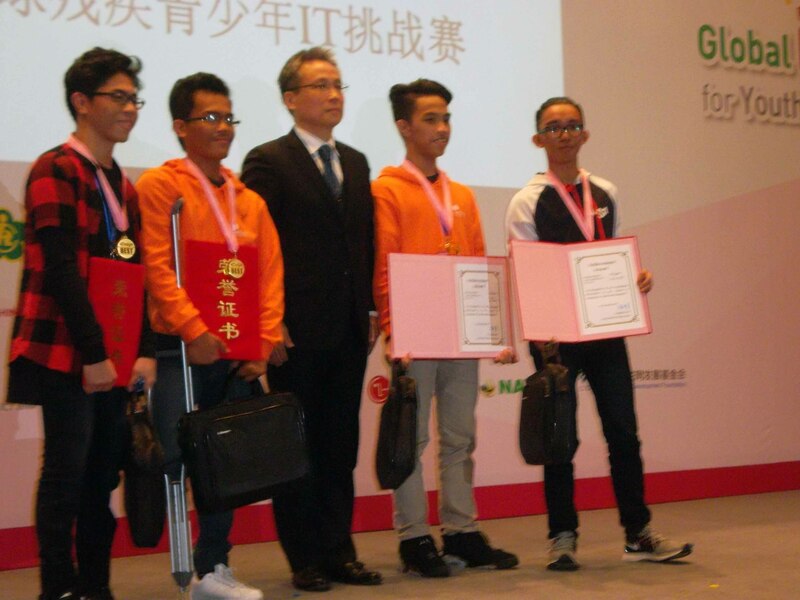 Filipino youth with disabilities made a breakthrough and impressive record during the 2016 Global IT Challenge (GITC) for Youth with Disabilities by bagging several medals in their respective event categories. The event participated in by 16 countries was held in Yangzhou, Jiangsu, China on November 21-25, 2016. Both first placers in the e-lifemap category are Nathaniel Edward Dimalanta under the hearing category and Mark Christian Evangelista under the visual category, who won gold medals. They also placed 2nd in the e-tool under the same categories with silver medals each. The Philippine team is composed of Nathaniel Edward, Mark Christian, Rey Chabby Estrera and Kahlil Guanco who also bagged 1st placer in the e-Design category. These youth are students of Philippine School for the Deaf, Philippine National School for the Blind, Ramon Magsaysay High School-Cubao and NOH-School for Crippled Children. The GITC is a project that challenges youth with disabilities to utilize ICTs to solve problems. The event is meant for four (4) categories of disabilities – visual, hearing, mobility and intellectual disabilities whose age ranges 13-19 years old and have general knowledge on Internet Explorer web browser, MS Office and Scratch Programs. In addition of providing them with the ability to leverage information and social participation, it seeks to set ICT agenda for participating countries to boost international cooperation and exchange for accessibility. For the Philippines, winning gold and silver medals in the international and prestigious competition like the GITC is quite a feat considering the better-trained competitors who receive greater support in terms of training and funding by their respective governments.